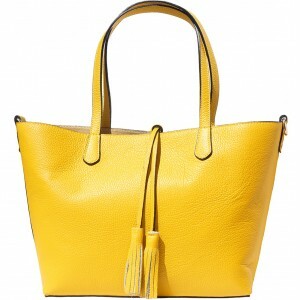 This leather tote bag is beautifully handcrafted with genuine Italian leather. It combines elegance with quality,features two soft and comfortable handles for an easy carrying. It is very stylish and functional for everyday use. This bag is also too roomy to hold all your essentials. Fabric fully-lined with two small interior pockets to store your small objects. Give it a pyramid shape by folding its sides, turning it into a medium size handbag. Decorative golden metal is hanged in one of the handles. This shopping bag made in Italy is fashionable and is available in a variety of colors to find your favorite one. Love the soft leather and contrast handles. Like that it zips closed.